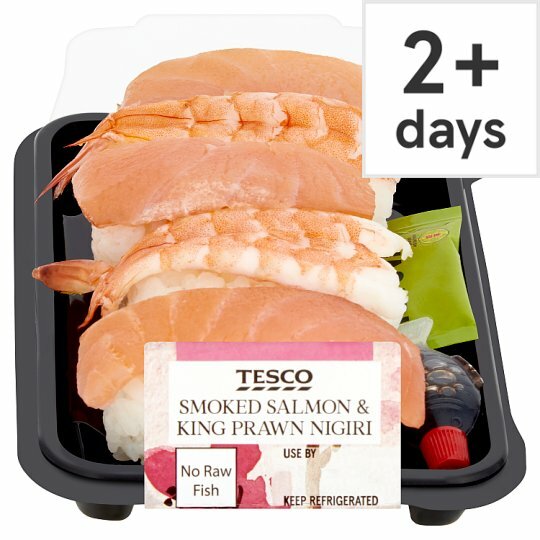 3 Smoked salmon nigiri, 2 king prawn and wasabi mayonnaise nigiri, 1 wasabi sachet and 1 bottle of soy sauce. A taste of Japan. Nigiri topped with smoked salmon and king prawn, and wasabi mayonnaise. Our sushi rice is cooked in traditional Japanese pots and seasoned. We then hand top our nigiri with carefully selected ingredients to deliver a taste of Japan. Cooked Sushi Rice, Smoked Salmon (Fish) (14%), King Prawn (Crustacean) (7%), Wasabi Sachet, Soy Sauce Bottle, Rapeseed Oil, Salt, Egg Yolk, Water, Spirit Vinegar, Horseradish Powder, Sugar, Mustard Powder, Colour (Curcumin). Cooked Sushi Rice contains: Water, White Rice, Rice Vinegar, Sugar, Spirit Vinegar, Salt, Rapeseed Oil. Wasabi Sachet contains: Horseradish, Wasabi. Soy Sauce Bottle contains: Water, Soya Bean, Salt, Vinegar, Ethanol. Also, may contain sesame seeds.. For allergens, see ingredients in bold. For best results remove from refrigerator 30 minutes before eating. Caution: This product may occasionally contain small fragments of shell..Caution: This product can contain minor bones..